The Outdoor Vitals StormLoft™ quilts are premium hammock insulation, made with responsibly-sourced, DWR-treated, certified 800+ FP down. The fabric is a super-soft and lightweight 10D ripstop nylon. The under quilt is full-length and has baffles on both ends for a secure seal. Cord locks on both sides are used to adjust and lock the quilt in position, as well as to adjust the end baffles. The top quilt has a sewn footbox and features a tapered design. Clips along the side of the top quilt can attach to elastics to wrap a sleeping pad for ground camping. The under quilt features a contoured design, similar to what you might see in cottage vendors. Outdoor Vitals is committed to making high-performing lightweight gear, and so far I’ve been impressed. Their gear has all the refinements I expect without needless additions. 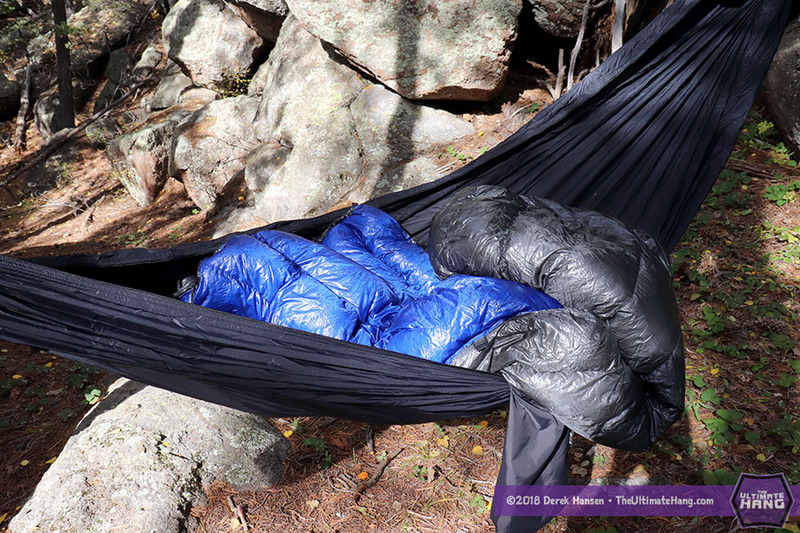 The top quilt uses a simple but very functional design with a baffle construction that eliminates weight but improves structure, especially in the sewn footbox. There is also weight saved by eliminating clips, snaps, Velcro, and cinch cords on the footbox, but that also means the StormLoft quilt isn’t modular (e.g., you can’t open it up and lay it flat). For me, that’s just fine, as it functions well as-is, and I can always convert it into a Match Coat if I need to. The under quilt adjustment system is a hybrid approach, similar to the ENO quilt cord locks so you can adjust and also “lock” the quilt in place along the shock cord. Let’s talk China. Yes, Outdoor Vitals sources their gear from China, so if you’re anti-imports, than just skip this outfit. Personally, I support a global market as long as the labor, manufacturing, sourcing, and delivery is sustainable and ethical. The sad truth is that materials are getting harder and harder to source locally, so even those who are “made in the USA” are sourcing from overseas. It’s a tricky business. I know of only a few hammock vendors who are actually sourcing fabric and materials locally, and it is expensive. I applaud Outdoor Vitals for their management because their gear is above nearly every other manufacturer who sources overseas. The materials and construction are simply top quality. I’ve had a blast testing the quilts, although I had to wait a while for the weather to really drop here in northern Arizona before I could really test the temperature rating. The under quilt seals up nicely and adjusts well. The top quilt foot box is as solid as they come and really holds its shape around my feet without shifting down. I think this was one of the first times I was able to sleep bare foot in the quilt and still keep my feet warm. It was awesome. Suspension and Anchor System ★ ★ ★ ★ ★ The under quilt comes prepared with ample shock cord and S-biner for quick connection to any hammock. Construction and Craftsmanship ★ ★ ★ ★ ★ Mass-market (off shore manufacturing) but really high-quality build. couldn’t find anything wrong with the build, and was impressed by the fine stitching, thought-out accessories, and premium materials. Modularity ★★★★☆ Open quilts like these are much more versatile than sewn-in quilts or regular sleeping bags, but the closed foot box on the top quilt does limit some of the usage, to a degree. Aesthetics ★★★★☆ Not a lot of color options, but the contrasting colors with the bright inner color and matte outer shell is a nice combination. Price and Value ★★★☆☆ Offshore production, but prices are a littler higher than I would expect, but still about 10% cheaper than the cottage vendors. Granted, down-filled gear—especially premium loft—is expensive regardless of where it is manufactured. Disclosure of material connection: The author (Derek Hansen) was provided with a free sample from the manufacturer for testing and evaluation purposes. The comments in this post (written & spoken) are of my own opinion, which I formed after personally handling the gear. I work with sea turtles and spend many nights in my Hennessy Explorer sleeping on the beach. Yes Maui gets a little chilly around 3AM even in the summer so I have lightweight UNO top and under quilts. I need something to keep me warm for mainland trips. I’m looking for about a forty degree rig thats compressible to a the smallest package available. Please provide the dimensions of the stuffed top and under quilt. Any down gear will pack to cantaloupe size, maybe smaller for a 40-degree bag. I would check out HammockGear.com.